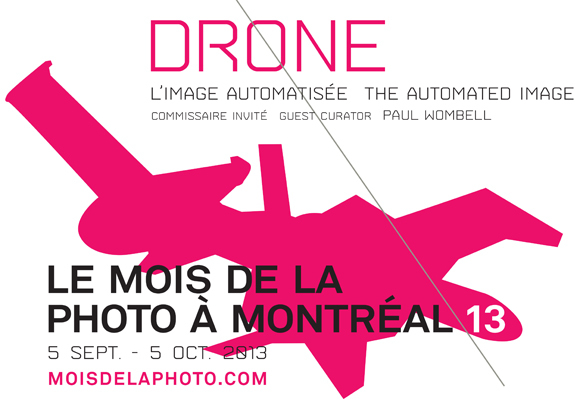 Le Mois de la Photo à Montréal invites you to its 13th edition, for which renowned British curator Paul Wombell has proposed a timely theme, Drone: The Automated Image. Our biennale of contemporary photography features 25 exhibitions in 14 sites across Montreal, with works by local, national, and international artists. Thanks to the generosity of our partners, all the exhibitions are free. Le Mois de la Photo à Montréal is proud to announce many of the artists featured in its 13th edition: Elina Brotherus (Finland/France), Michel Campeau (Canada), Raphael Dallaporta (France), Max Dean (Canada), Véronique Ducharme (Canada), the artists’ collective ExpVisLab (Hungary/Canada/United States), Mishka Henner (United Kingdom), Craig Kalpakjian (United States), Trevor Paglan (United States), Barbara Probst (Germany/United States), Jon Rafman (Canada), David K. Ross (Canada), Tomoko Sawada (Japan), Kevin Schmidt (Canada), Cheryl Sourkes (Canada), Jana Sterbak (Canada/Czech Republic), WassinkLundgren (Netherlands/United Kingdom/China), and Donovan Wylie (Northern Ireland). Stay tuned for more details—during the coming weeks, Le Mois de la Photo à Montréal will reveal its complete programming including the eight artists whose works will be shown at the Darling Foundry. This VIP evening is an exclusive opportunity to preview the works of eight artists exhibited at the Darling Foundry. Enjoy a cocktail and have a chat with artists and art professionals. Join us for a lively evening on September 4. Join us in celebrating the public launch of the 13th edition of Le Mois de la Photo à Montréal at the Darling Foundry on Thursday, September 5 as well as the first weekend of festivities, openings, artists’ talks, etc. on September 6, 7 & 8. A day-long conversation on the automated image with guest curator Paul Wombell, twenty of the exhibiting artists, and the public on September 8. On the evening of September 26, artists Michel Campeau, Pascal Dufaux, Jon Rafman and Jana Sterbak will join Paul Wombell in a discussion on the camera and how, over the last century, its many technical developments have changed the ways it is employed. For information and the complete program of special events and ticketing, click here. Inspired by the theme, Drone: The Automated Image, the educational program of Le Mois de la Photo à Montréal offers a series activities that are designed to offer visitors the options of exploring the exhibitions either independently, as a family, or as a group. In addition, a reading room at the Darling Foundry will provide a rich array of documentation about the artists, texts related to the curatorial theme, as well as a selection of publications from Le Mois de la Photo à Montréal. Edited by Paul Wombell, Drone: The Automated Image brings together new essays by leading authors on contemporary art and technology that explore the shifting relationship between the camera and the body. Co-produced with Kerber Verlag, this 250-page book will be available in English and French versions, and will be available in several participating exhibition venues as well as better bookstores in Europe and North America. Download the iPhone app of Le Mois de la Photo à Montréal to have the whole program at your fingertips!